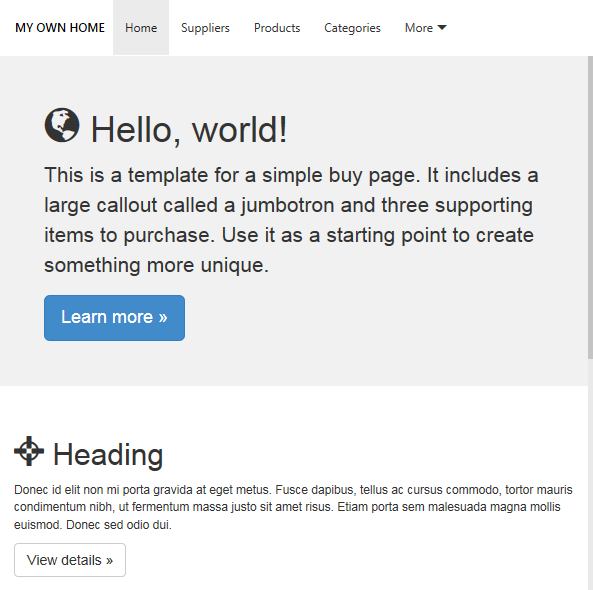 Let’s explore a few customization ideas for the home page and toolbar of your app. 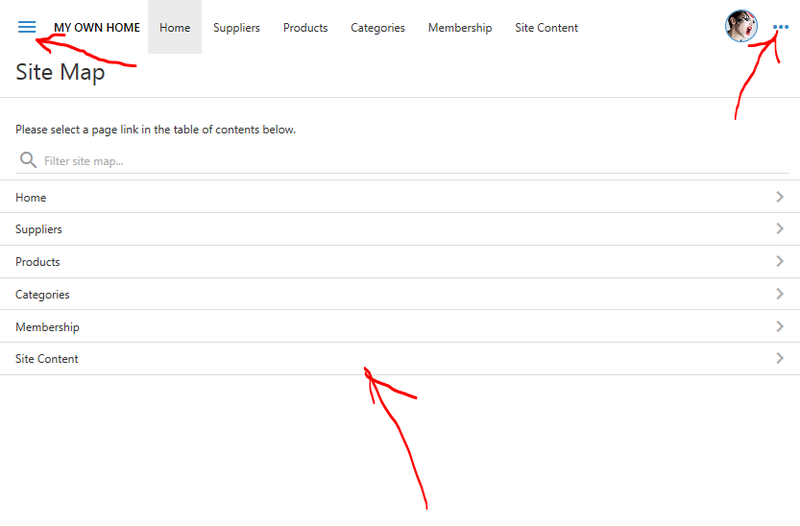 The default home page displays a table of contents. The toolbar has “hamburger” button (“bars” icon) of the left side and content menu button (“more” icon) on the right sidebar. The illustration is presented in Light theme with Modern accent. A customized home of an app based on Touch UI may display marketing and informative content to the end users instead of a default table of contents. Let’s remove the table of contents from the home page and replace it with a marketing message for the end users of the app. Have you noticed that the new design does not have the Menu and More buttons on the toolbar? By default the data pages of the app do display both buttons just like the default home page with the table contents. Let’s hide the Menu and More buttons on the toolbar on the data pages as well. 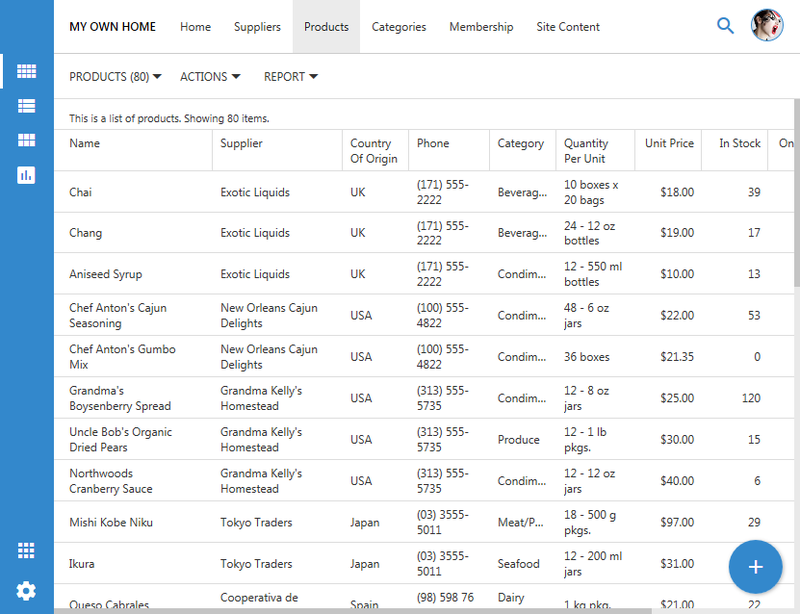 This is how the data pages will look when the left sidebar is expanded. Select the project name on the start page of the app generator and locate “Home” page in the Project Explorer on the right hand side of the Project Designer. Right-click and delete both containers on the page. This will remove the table of contents displayed to the authenticated users and the welcome message displayed to anonymous users. 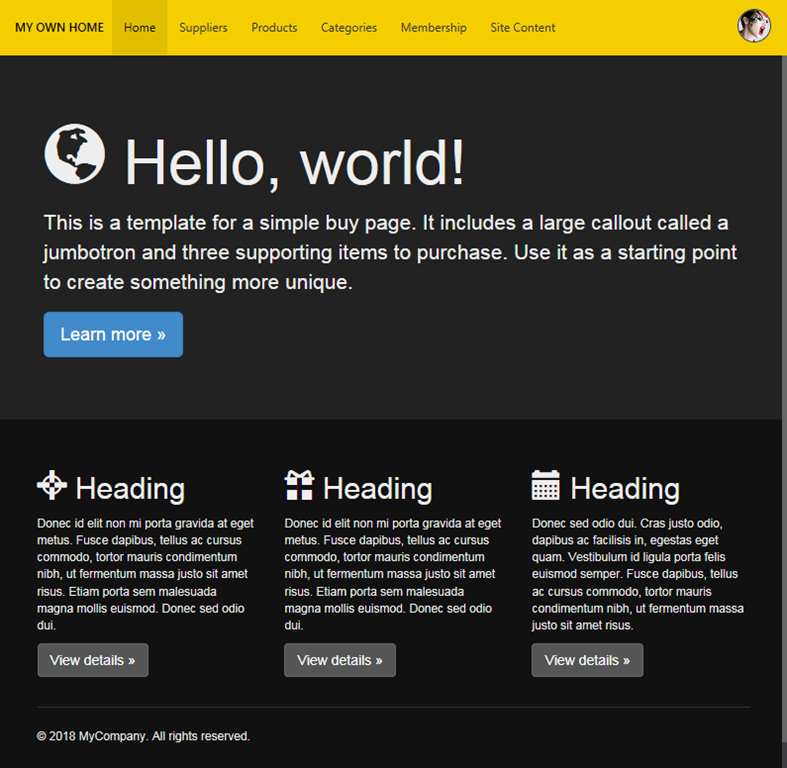 Double-click the home page, select Jumbotron as the Template, save changes, and generate the app. Inspect the home page. It will look similar to the one in the picture. Try other templates to find the best fit for your app. Lock the page from being overwritten during the code generation before making any changes to the content of the template. 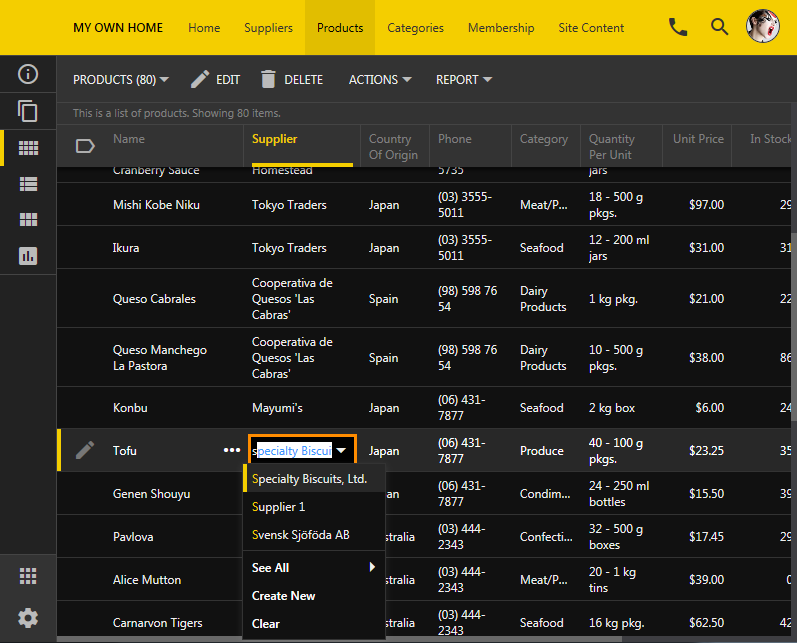 Double-click the home page in the Project Explorer and specify First Time Only in the Generate property. Save the changes. The home page icon will display with the “lock” indicating that any changes to the app will be preserved if the page exists already. 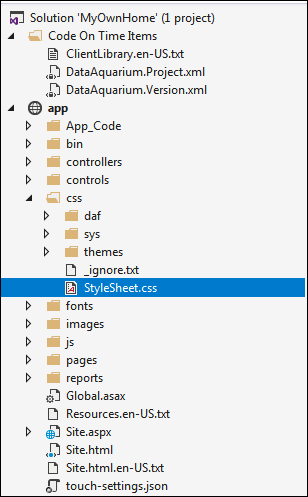 Click Develop on the toolbar of the Project Designer and add a new stylesheet with the name of choosing under ~/app/css/ folder. 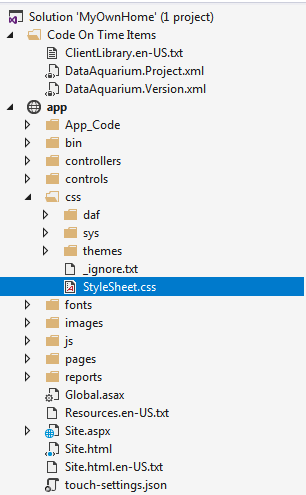 Enter the following CSS rules in the file app/css/StyleSheet.css. The comments provided next to the CSS rules explain their effect on the User Interface of the app. Rules (1) and (2) are hiding Menu and More buttons on the toolbar. Rule (3) shifts the text in the Logo area to the left when the sidebar is not visible. 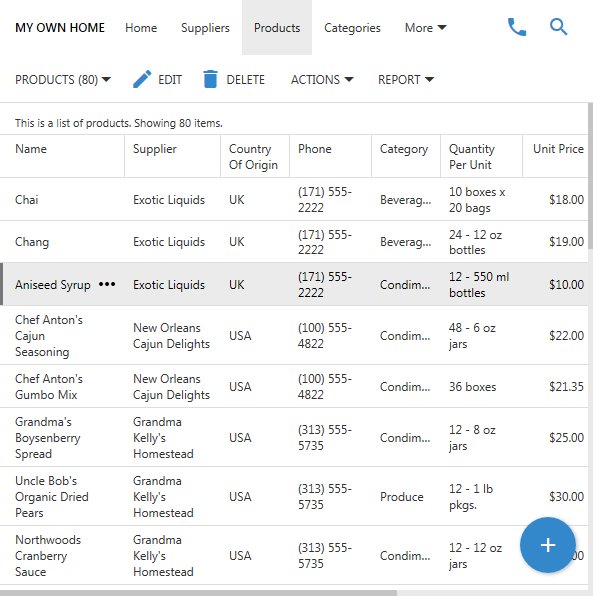 The same rules also apply to data pages. A data page of an app based on Touch UI with customized toolbar on a narrow screen is shown next. If the screen of the device is narrow then modal pages will be automatically replaced with fullscreen pages. In that case rule (1) does not apply and the Back is visible next to the name of the previous view. 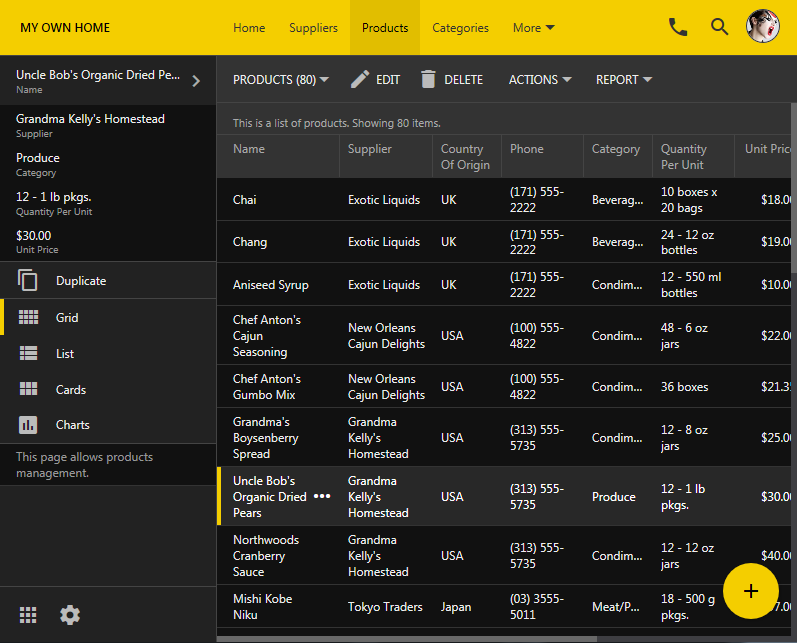 In this screenshot the user continues to drill into data and views the Category information of a product. Button Back remains visible and button More is not displayed. 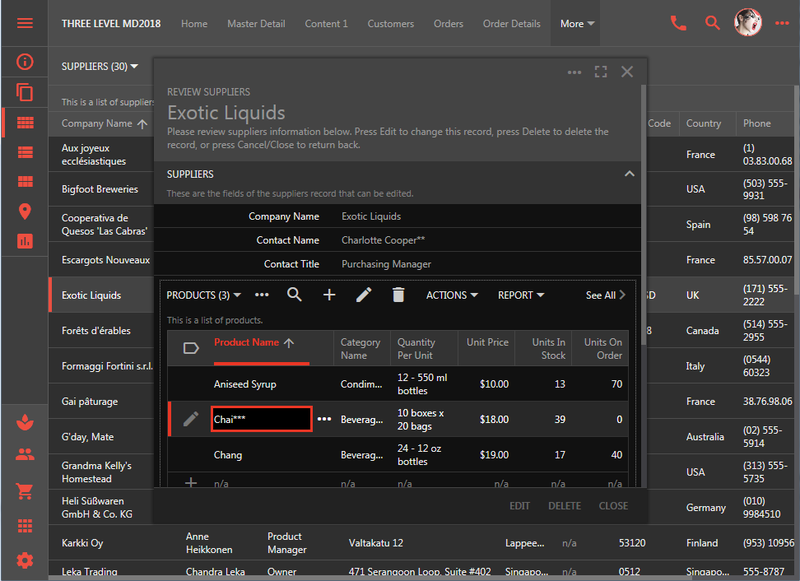 Rule (4) shifts context actions to the right of the toolbar. Here is how the same changes will look in Dark theme with Construction accent. 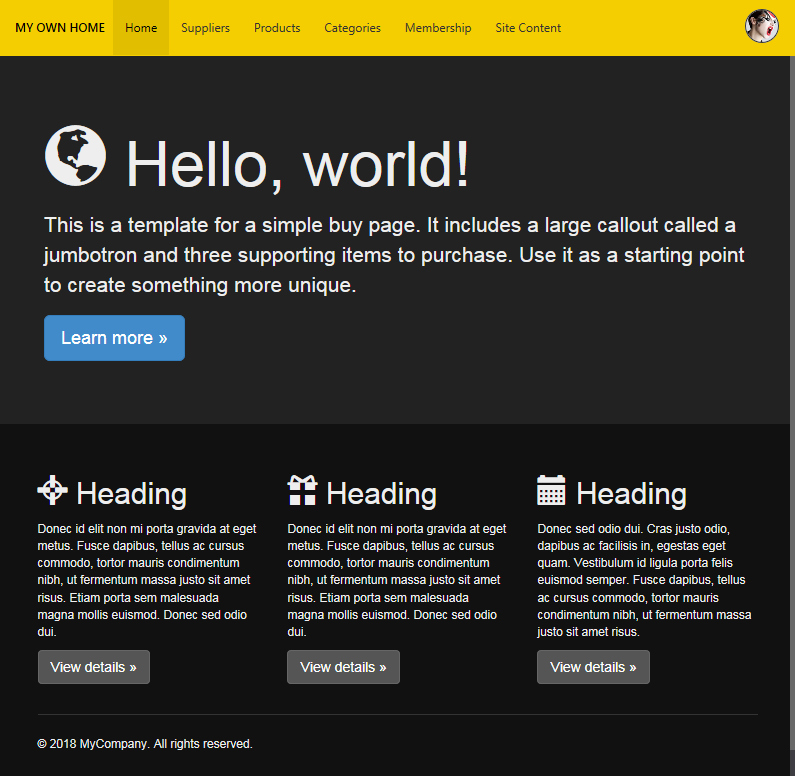 This is the home page without Menu and More buttons on the toolbar. 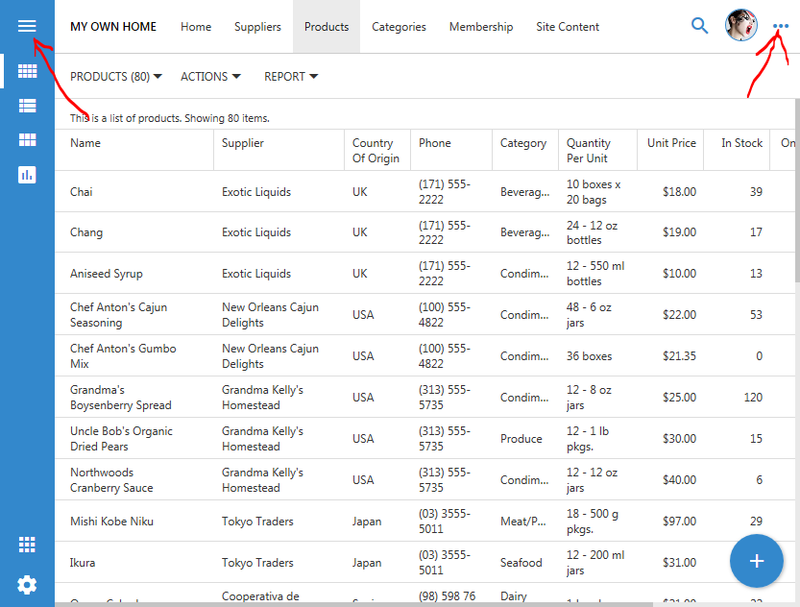 This is the data page with the expanded sidebar. 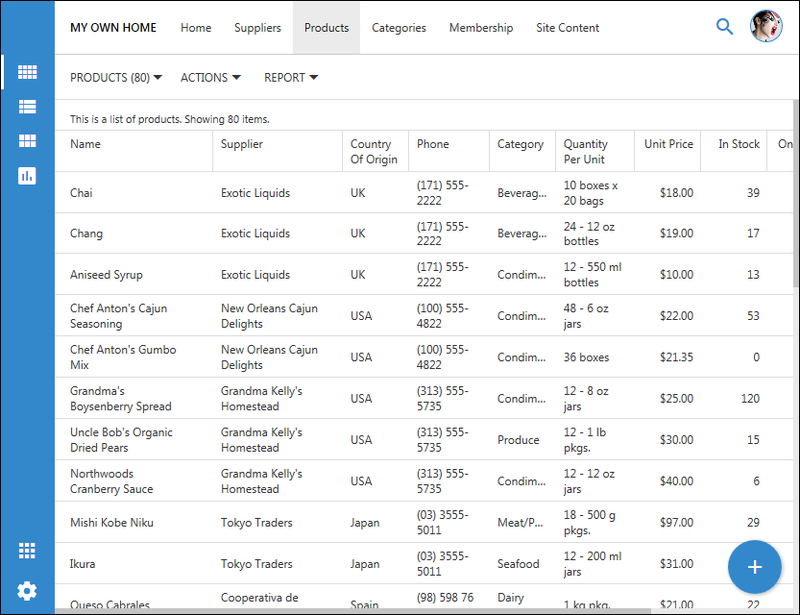 This is the data page with the collapsed sidebar in inline editing mode. This is the same app on a small device without More button in the toolbar. A fullscreen page of an app created with Code On Time application generator presented on a narrow screen. Touch UI is entirely CSS-driven and allows customization of various aspects of user interface. HTML+ VB.NET projects created with application framework in class library will compile correctly. Resizing of columns is repositioning the inline editor selection frame. 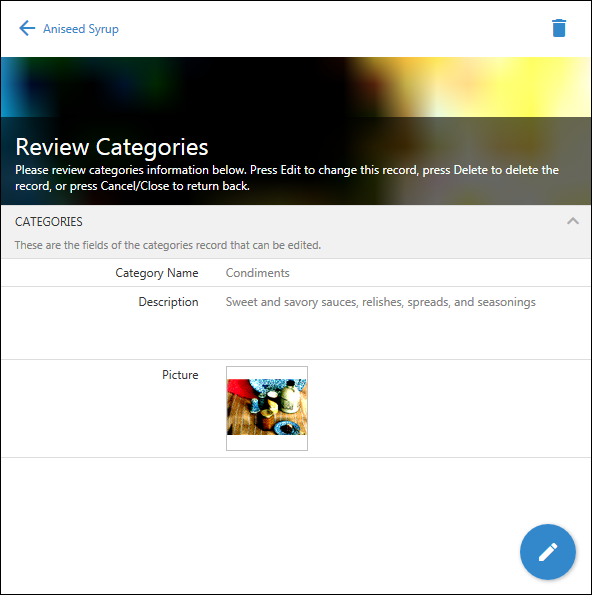 Batch Edit form does not display "Record changed by another user" when saving edits. Fixed issue opening code business rules with projects using new "app" folder. Added display of stack trace from exceptions only when localhost or custom errors are not enabled. Portuguese translations - thank you Nielsen Bautista! Release 8.7.0.0 is finally here and introduces many new amazing features! 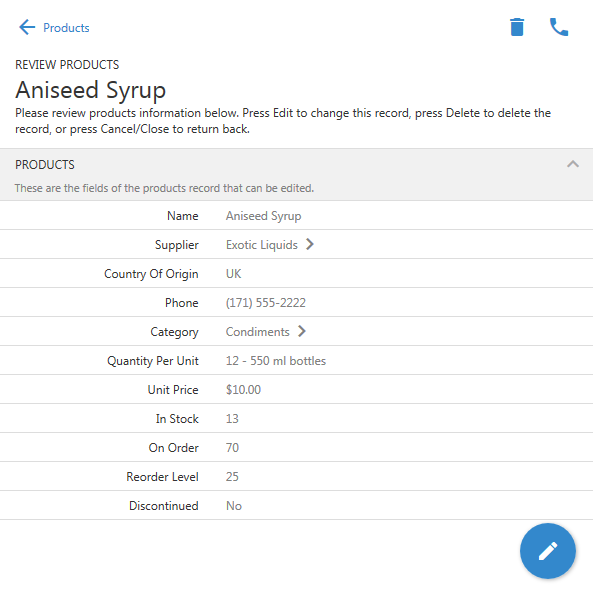 Your apps will run in a native mode with inline editing, multi-level master-detail data views, transactional data input, and more. In the coming days we will post multiple video tutorials covering the new features available in your apps. Subscribe to our YouTube to say up-to-date at https://youtube.com/codeontime. Configuring Application for Cloud On Time. We are very excited to offer the first practical and universal implementation of inline editing in Touch UI. Inline Editing is the built-in feature available in apps created with Premium edition of Code On Time. It requires zero configuration and offers a high level of control when needed. 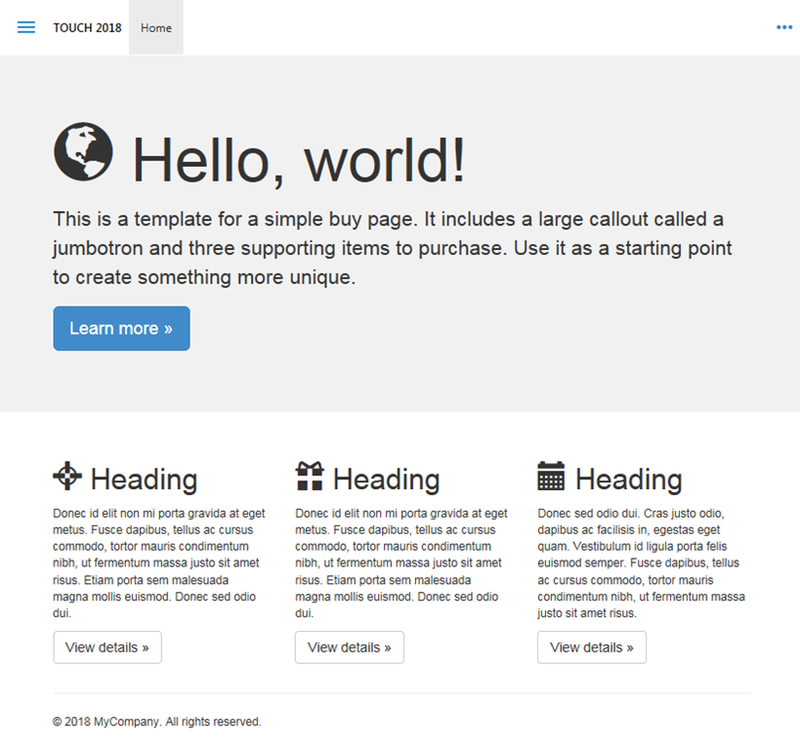 The feature is stable and ready for production use. We have a long list of various enhancements planned already. Many of them will be addressing some imperfections that we know about. Another minor release will go out in about a week and will introduce a performance enhancing feature called Optimistic Saving. This feature will be enabled by default in all apps. It will further enhance inline editing and change our approach to data saving via forms in general. The native client is here. We have started with two native clients for Windows 10 and Windows 7. Our app generator is a Windows-based product. We wanted to make sure that you can build native apps without requiring anything else on the development machine. In the next 45 days we will release support for iOS with Android and MacOS to follow. Download the universal native client for Windows 7 and above at https://codeontime.com/releases/cloud-on-time-for-windows-7. 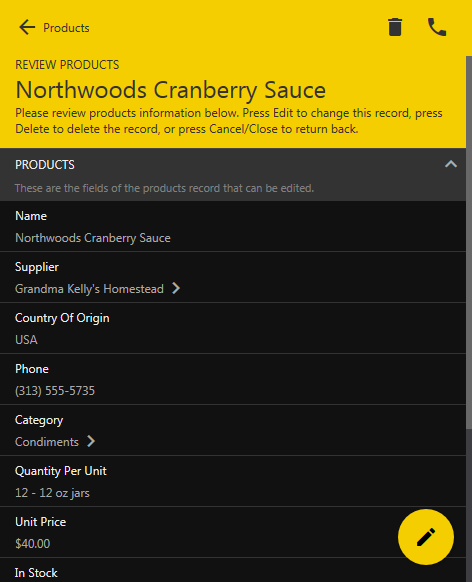 Download the universal native client for Windows 10 at https://www.microsoft.com/en-us/store/p/cloud-on-time/9nblggh404nb. 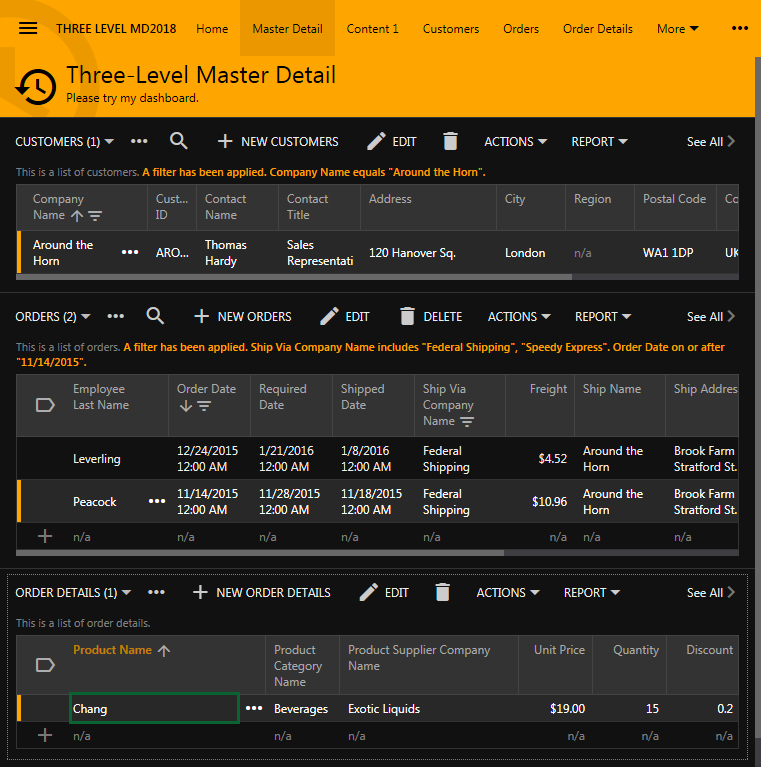 Touch UI now supports multi-level master-detail relationships between data views in dashboards, full-screen, and modal forms. Data View fields can another such field in the data controller serve as the filter. Developers can configure relationships with any number of levels and complexity. 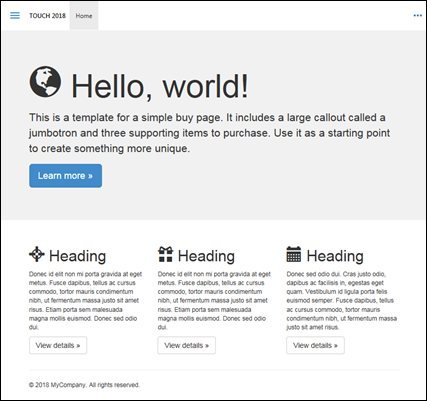 Build a new app and try it in a web browser. You will notice that the data displays virtually instantly. Open the source of the page with CTRL+U and you will see that the data comes embedded in the page. This is a performance enhanching feature targeting web users of your apps. We are preparing a tutorial explaining how that works. Transactional data input is now available. The feature is disabled by default. Enter odp.enabled=true in ~/touch-settings.json and your will be able to enter data in transactional fashion if you add Data View fields in createForm1. Note that inline editing is not yet compatible with ODP (Offline Data Processor). Some features of the server-side framework are also missing. Release 8.8.0.0 will go out in June of 2018 along with a new product called Offline Sync Add-On. The release will make ODP a standard feature enabled by default and will make possible to build apps that work in disconnected/offline mode without writing any code. The majority of the code has been completed. We are preparing the infrastructure to start selling Offline Sync. 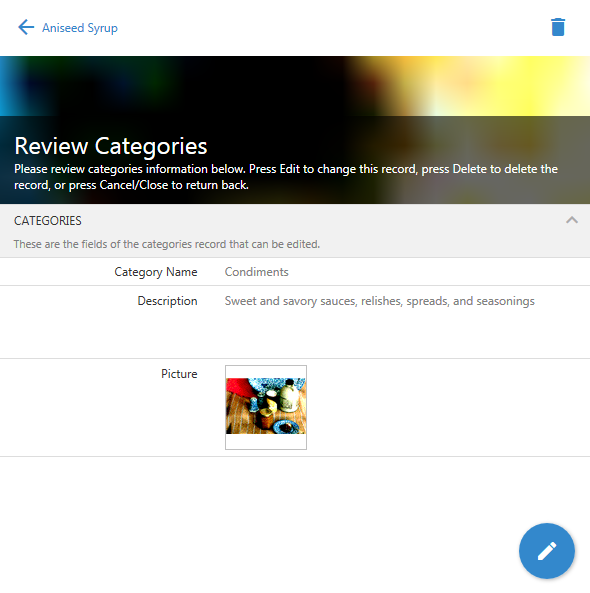 New apps will have a new folder structure. Learn more at http://codeontime.com/blog/2018/03/app-factory-vs-app-factory-advanced. We are planning to start hosting live video sessions on our YouTube channel each Friday at 10:00 AM. The purpose is to provide a real time demonstration of various product features. Viewers will be able to submit questions ahead of time, watch the show live, or review the latest episodes at their own convenience. Each session will include answers to your questions, we will tell you about the new stuff we are working on. The primary purpose will be to demonstrate how to use our product with practical exercises. New field values changed with custom actions are displayed when user activates the invisible content with tabs. Previously the original row values were displayed instead. Method $app.execute now supports argument property "background" to control if the UI is to be blocked. If set to true then a non-blocking background call is executed without any indication of progress. 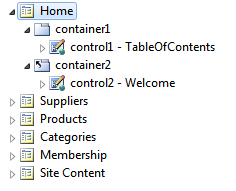 Data views displaying data in grid are automatically synced when user returns to the previous pages and there were changes to the same data controllers prior to return. Wide scrollbars are enabled if (1) ui.scrollbars.wide == true or (2) ui.scrollbars.wide == 'pointer' and the pointing device is not "touch". Tags inline-editing, inline-editing-none, inline-editing-when-pointer, and inline-editing-option-none are controlling "Inline Editing" mode in the view. Web.config now includes <authentication mode="None"> for apps with no membership. Ensured js/_ignore.txt is copied to output directory in Web App Factory projects. ListBox, CheckBoxList, RadioButtonList styling is matched to accents. Fixed issue with agenda not selecting rows properly. Fixed issue with incorrect page being displayed as selected in site menu. Added support for "view-selector-none" tag to disable view selector on lookup fields. URL Hashing replaces spaces with "+" when getting from URL to avoid exception. Fixed Azure Publish re-authentication bug. 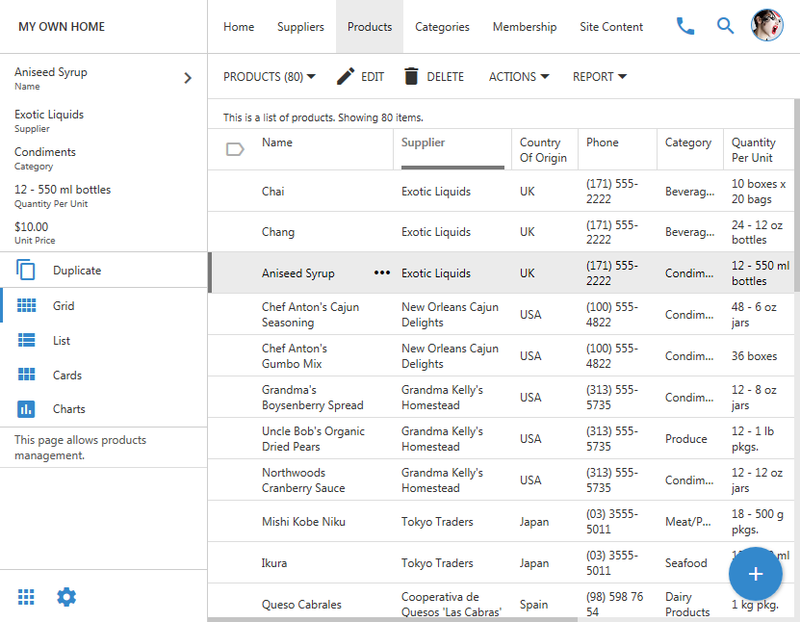 Dbl-click on modal title bar will toggle fullscreen mode of a form. Added haxisformat and vaxisformat properties to allow formatting the axis values using the following options: none, decimal, scientific, percent, currency, short, long. Publish now supports FTPS by using "ftps" in the URL. Blob Handler now checks if user has acess to BLOB column and requested row before streaming to user. Blob adapters are publicly accessible if no membership is enabled. ApplicationServices.HandleError and ApplicationServices.HandleException is now overridable to allow for custom error logging. If command Confirm with argument set to the name of the child dataview field is specified then field values are accessible in business rules of custom data controller as @Parameters_MasterFiel1, etc. 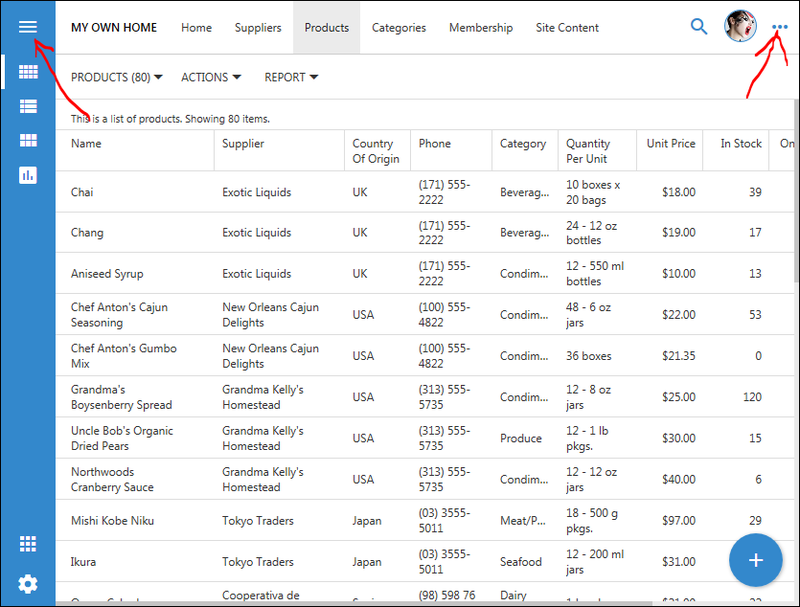 It is now possible to implement custom search with stored procedures as explained at https://www.youtube.com/watch?v=ClCHL8JuuMg&t=0s&index=4&list=PLy2g3SjvDe2b2cl9i0msBaMVLntQucZtb. SQL business rules support @[FieldName]_FilterValue1 and @[FieldName]_FilterValue2 for reading filter values. New Advanced Search tags for data fields. Field values with HtmlEncode = false and containing HTML content will not be trimmed. Advanced Search displays "yes" and "no" options for Boolean fields.